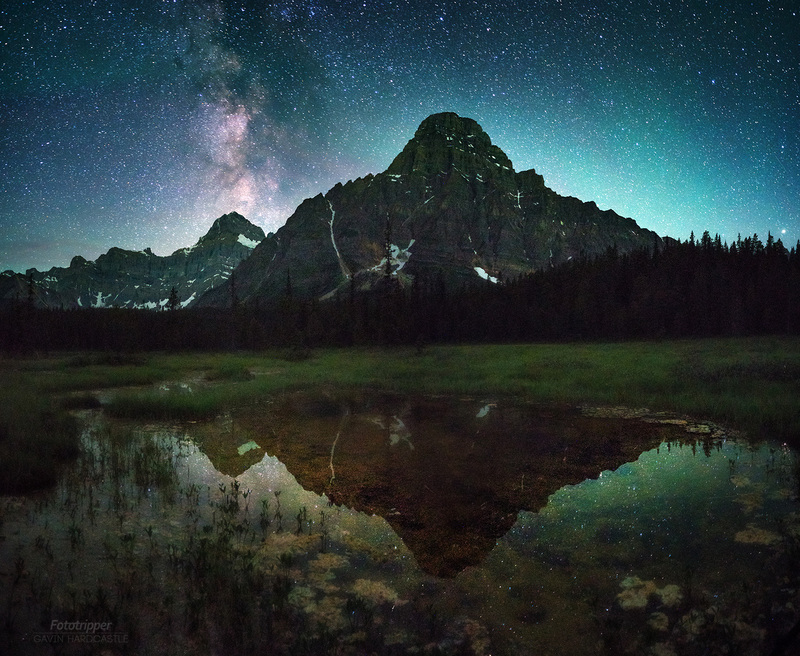 When I shone my headlamp down into the swampy, stinky waters at the base of Mt Chephren in Banff National Park, I thought I spied a large black slug swimming. Upon closer inspection it was a large blood sucking leach diving from the glare of my headlamp to shield it’s vampyric nastiness. This was a surprisingly tricky shot to capture. You’re actually looking at a 5 shot vertical panorama and each shot was a 30″ exposure. There was absolutely no moon so it was as dark as it gets. I had to shoot at ISO 6400 which is something I try to avoid as I hate noisy images. The other challenge I had was that the boggy marsh kept sucking my tripod down into it’s clammy clutches. The movement of my sinking tripod was causing blurring and star trails so I had to force all of my weight on the tripod to make sure it hit rock bottom and stopped sinking. After many failed attempts I finally managed to capture some stable shots for my pano. I made lots of noise so as not to surprise any bears as I had no chance of making it back to my car if trouble came my way. Luckily it was just me, my student and one grossly engorged leech. If you’d like to order a high resolution print of ‘Attack of the Killer Leeches’, please get in touch via my contact form and let me know your preferred size. Prints can be provided under acrylic, on metal, paper or even mounted and framed depending on your taste.